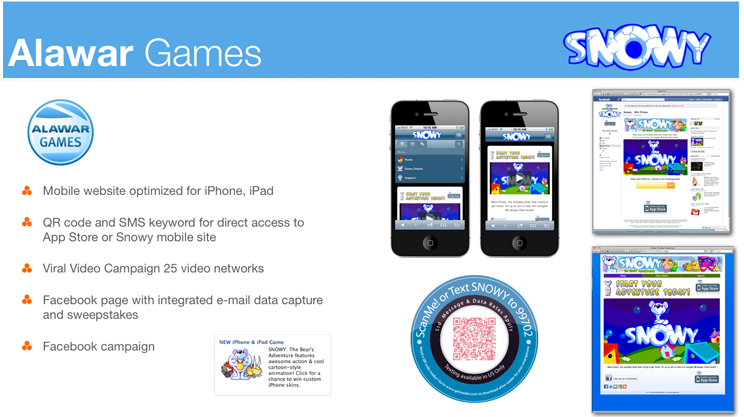 A mobile optimized landing page, Facebook sweepstakes app and campaign were developed to promote the iPhone game Snowy. The integrated campaign also included press releases, a ShortQR™ and viral video postings. The mobile page also included device detection that redirects non-mobile devices to a traditional version of the promotional landing page. The ShortQR™ combines the convenience of mobile website link delivery via short code or QR code based on user preferences. See ShortQR™ Codes for more information.